US/Washington: Yangtze Store, an Amazon.com online establishment, recalls an estimated 640 Women’s Silk Scarves due to suspected failure to meet US Federal Flammability Standard Hazard and consequential risk of fire, burns and property damage, all serious health and safety hazards. The US Consumer Product Safety Commission (“CPSC”) reports this recall involves certain 100% silk Yangtze Store Women’s Scarves. The recalled Scarves measure about 67 inches long by 22 inches wide. The Scarves were sold in the following 11 colors: black, fuchsia, green, light blue, navy, red, taupe, turquoise, pink, purple and white. 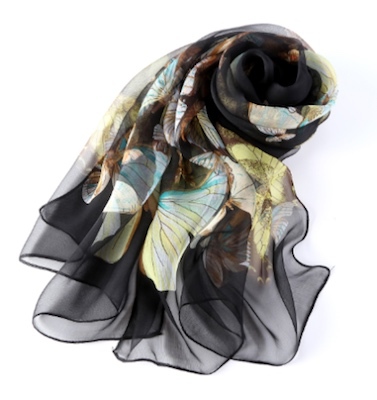 On Amazon.com, the recalled Scarves were sold as “Long Georgette Silk Scarf Butterfly Print”. Please consult the photograph above for details of the product’s packaging, design and retail presentation. Additional images of the recalled Women’s Silk Scarves can be found on the Web site/sites listed above. According to the CPSC, the women’s scarves fail to meet US Federal Flammability Standard for clothing textiles, posing a risk of burn injuries to wearers. If you believe you have purchased or have in your possession any of the recalled Women’s Silk Scarves, please do not use them. Instead, kindly return the product to the online store where you purchased it for a full refund. If you have any questions about this recall notification, please contact Yangtze Store toll-free at 1-877-861-1539 from 9:00 AM to 5:00 PM, Eastern Standard Time, Monday to Friday. Alternatively, you can visit the company’s Web site at http://www.yangtzestore.com and click on the Recall Notice tab located at the bottom of the Web page for more information. You can also e-mail at yangtzestore@gmail.com with the phrase, “Product Recall” in the Subject line. ==> To see other recalls and notifications caused by suspected faulty and/or dangerous Women’s Silk Scarves, please search for “scarf” using the Search Box at the top of this page. ==> To see other recalls and notifications relating to products made, marketed and/or sold by Yangtze Store, please search for “Yangtze” using the Search Box at the top of this page. ==> To see other recalls and notifications relating to products made, marketed and/or sold using an Amazon.com storefront, please search for “Amazon” using the Search Box at the top of this page.